There was a time when the only thing I made with fresh cranberries was cranberry sauce. Today I love to use them in my baking. Their tart flavor, when tempered with sugar, makes very good pies, tarts, cakes, scones, and breads. 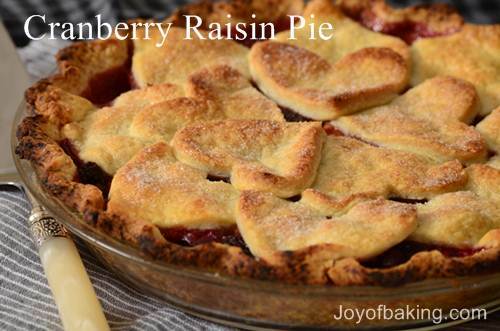 Cranberry Raisin Pie is my newest cranberry recipe. It has a rich and spicy filling that is full of fresh cranberries, raisins, chunks of apple, chopped walnuts, and even candied mixed peel. Take one bite and you might find yourself thinking of mincemeat, albeit an alcohol free, vegetarian-style mincemeat. Serve it warm, with or without a scoop of vanilla ice cream. 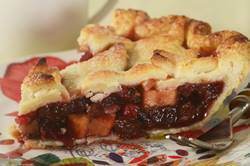 Since this Cranberry Raisin Pie has both a top and bottom pastry crust, it has that perfect pastry-to- filling ratio. I am using my favorite pie crust pastry, Pate Brisee, which has a buttery flavor and a crumbly texture that pairs well with all the rich flavors of the filling. As you will notice from the picture I have made the top crust quite decorative, and this is done by cutting the pastry into hearts using a heart-shaped cookie cutter. This really dresses up the pie and also serves the purpose of allowing everyone to get a peak at the filling. The pie is baked in a rather hot oven which turns the pastry a lovely golden brown color with a crisp texture. As I said above, the filling is really a very simple vegetarian, alcohol free mincemeat. This recipe comes from my mom who, like me, was a clipper of recipes. She found this recipe (and it's a good one) in our local Winnipeg (Canada) newspaper back in the 1970s. The author was Margo Oliver and she describes this pie's filling as "this spicy filling is almost a not-to-rich mincemeat". The first step in making this filling is to bring the raisins (use dark or golden), combined with a little water, orange juice, and lemon juice, to a boil and then the cranberries are added and cooked until they "pop". This mixture is then removed from the heat, and the chunks of firm textured apple (I used Granny Smith), the walnuts (can use pecans, almonds, or hazelnuts), the candied mixed peel (this is optional), sugar, citrus rind, and spices are simply stirred in, and allowed to cool. If you like you can add a splash of Grand Marnier to this mixture. Then all that is left is to pour the filling into the chilled pie crust, top with the pastry hearts, and bake the pie until the pastry is set and has turned a lovely golden brown. Let cool slightly and serve warm or at room temperature with a dollop of whipped cream or a scoop of vanilla ice cream. What a perfect cold weather dessert. Pie Crust: In a food processor, place the flour, salt, and sugar and process until combined. Add the butter and process until the mixture looks like coarse crumbs. Pour 1/4 cup (60 ml) water in a slow, steady stream, through the feed tube until the dough just holds together when pinched. If necessary, add more water. Turn the dough onto your work surface and gather into a ball. Divide the dough in half, flattening each half into a disk, cover with plastic wrap, and refrigerate for about one hour, or until firm. After the dough has chilled, remove one portion from the fridge and place on a lightly floured surface. Roll the pastry into a 12 inch (30 cm) circle. (To prevent the pastry from sticking to the counter and to ensure even thickness, keep lifting up and turning the pastry a quarter turn as you roll (always roll from the center of the pastry outwards).) Fold the dough in half and transfer to a 9 inch (23 cm) pie pan. Tuck the overhanging pastry under itself, crimping as desired. Cover and refrigerate for about 30 minutes before filling. Then remove the second round of pastry and roll it into a 12 inch (30 cm) circle. Using a 2 1/2 inch (6 cm) heart shaped cookie cutter, cut out about 20 hearts. Place the hearts on a parchment paper-lined baking sheet, cover with plastic wrap, and place in the refrigerator for about 30 minutes. Cranberry Raisin Filling: Place the raisins, water, orange juice, and lemon juice in a saucepan and bring to a boil. Add the cranberries and cook until their skins pop, about 3-5 minutes. Remove from heat, add the apples, sugar, candied peel, nuts, orange rind, ground cinnamon and salt, and let cool. Preheat oven to 425 degrees F (215 degrees C). Pour the filling into the pie pan lined with pastry. Cut 1 tablespoon of butter into small pieces and sprinkle over the filling. Then, in a small bowl, whisk together one egg and 1 tablespoon cream. Lightly brush the edges of the pastry with the egg wash. Starting at the outside edge of the pie, place the cut out pastry hearts in a circular pattern on top of the filling, making sure the edges of the hearts are touching. Once the top of the pie is completely covered with the pastry hearts, brush the entire surface with the egg wash, making sure that it does not pool. Sprinkle with sugar. Bake until the crust is set and golden brown, about 30 - 35 minutes. Remove from oven and let cool slightly. Best served warm. Makes 1 - 9 inch (23 cm) pie.